WINNER of In the Belly of Jonah! It's no surprise to anyone in my life that I would read this book. Reviewing it however was tough. I saw a lot of myself in many of the pages. I am indeed a Paranoid Parent! For some of my old followers, you may remember the accident my son had last fall. For my new followers, well, let's just say that moment changed how I parent. I NOW worry about everything! This book is very straight forward and to the point, full of facts, surveys and real life stories. This, as a parent, I can appreciate. It lists the most common fears that parents have and then outlines them nice and neat by age; from Infants to College. I have quite a few post it notes on the toddler section myself. Did you know that shopping carts are dangerous? Yes, they are. They are the leading cause of brain trauma. Holy crap! Helpful to know. Yes. Terrifying? Yes! 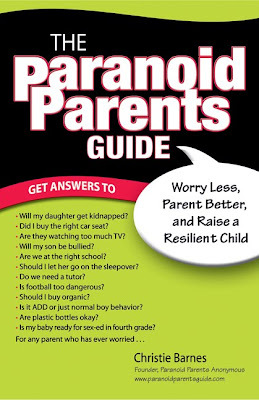 One of my favorite chapters is Chapter 4; Myths expose: Parents' top Worries Versus Children's Real Dangers. This is where her research kicks in and out get some straight forward facts. She breaks down the reality of some of the harmful things that could happen, like drugs, kidnapping and abuse. This book is not something you sit down and read cover to cover. You read it bits at a time. It takes some processing. Did I feel immediately better after reading it? No. Did I feel more paranoid? No, not really. I felt more aware and informed. That, in any respect, is helpful in my eyes. In some areas I feel I know a bit more than I wanted but knowledge is power, I think. Thank you to TLC Book Tours for asking me to participate in this tour. Please stop by the following blogs to read more about this title. Sounds like a good one :) Great review! Thanks Michelle, I will get this book for sure and share it with my iVillage parenting board. I have a 3 year old daughter. Great review! And the shopping cart thing? That is a very serious. My friend works in an ER in a big city and sees a lot of kids injured from falls in shopping carts. They stand and fall out, or they reach for something and it falls over, or they are outside of it and pull it on top of themselves. I mean, you'd never think it was so dangerous but it really is. I don't know if the book mentions cheerleading or bunk beds but those are accident-ridden as well! Thank you so much for being on the tour!